Jacksonville is a huge city. I’ve lived here for about 4 years now and there are swaths of the city I haven’t even driven through yet. What’s great about Jacksonville is within this large land mass are individual neighborhoods with their own identity, shopping areas, restaurants, etc. What’s bad about that sometimes is it’s easy to get into a rut, never leaving your neighborhood since everything you need is right there, comfortably living within your zip code with no desire or need to explore outside of it. I’m guilty of that. If you follow my reviews or Instagram account, you can see I hover around the same areas of Jacksonville. So when we got an invite from Cousin Willie’s Smokehouse all the way out in Baldwin, I was excited because I would get to leave my comfort zone and explore. I’ve never been to Baldwin. In fact, I’ve never been farther west than the 295 beltway unless I was evacuating a hurricane. So on a Saturday afternoon, we packed up our Sherpa and ventured out into the wild blue yonder. Cousin Willie’s is a quaint country BBQ restaurant right off of Hwy 90. Owners Powell and Leslie Peacock have operated Cousin Willie’s since November 2016. Powell heads the back of house, running the kitchen and the smoker. Leslie is an HR consultant by trade and runs the front of house and handles the business side of things. She’s also a baker and makes the restaurant’s desserts. Both are lovely, salt-of-the-earth, down home people. They love what they do and love sharing their food with as many people as possible. Besides the restaurant, they also run a successful catering business and built relationships with Baldwin Middle-Senior High School to cater events. 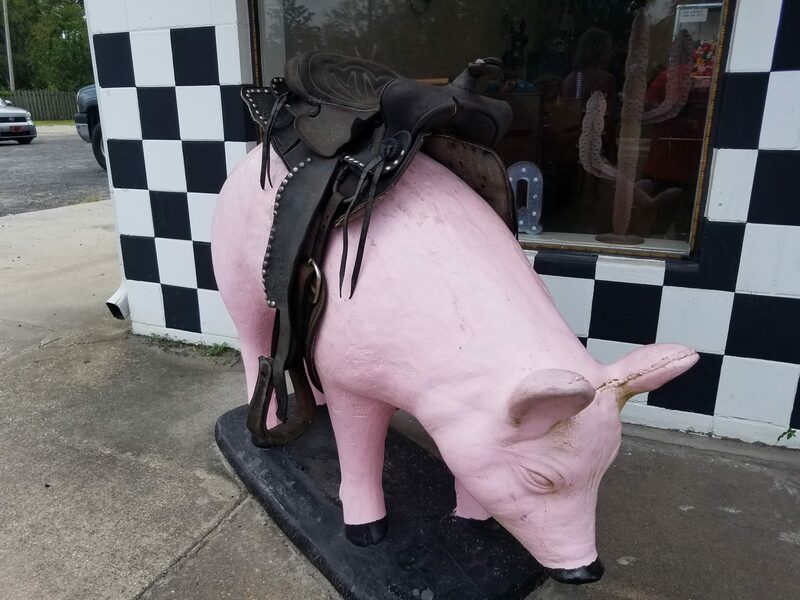 A large saddled pig sculpture greets you as you walk up to the entrance. It’s a cute decorative touch and beckons visitors to sit on it for an Instagrammable moment. Inside is a small space, minimally decorated, with the wonderful smells from the smoker filling the air. We came between lunch and dinner, so it wasn’t crowded, but talking to Powell and Leslie, game day weekends can be very busy, especially when the high school across the street has home games. We sat down to eat and I gave myself over to the mercy of Leslie and Powell, telling them to bring out whatever they wanted us to try. We started out with a couple of appetizers: pulled pork nachos and fried squash. The Fried Squash is a great alternative to those that may want to try a fried pickle, but can’t get past the concept of a fried pickle. It’s a good entry point to fried gourds. 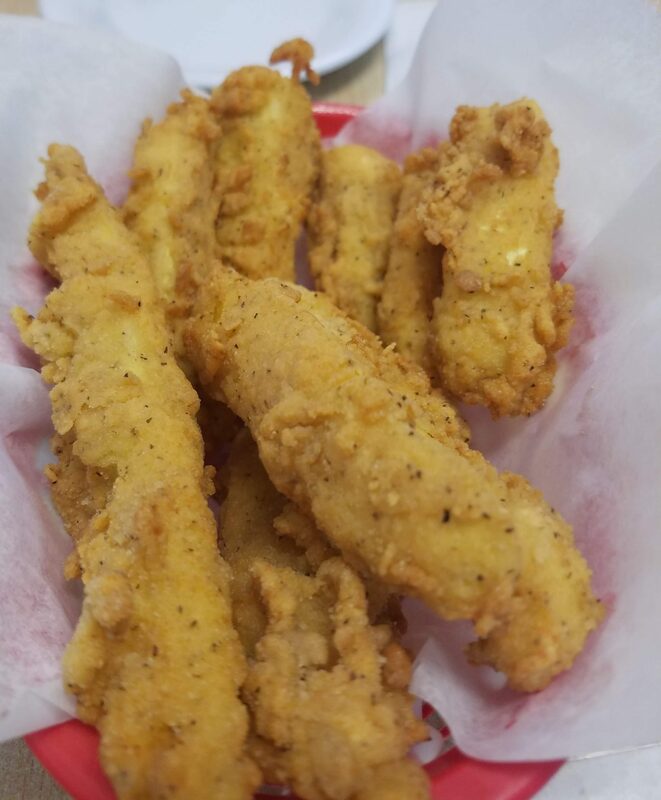 These were fried perfectly. The breading was nice and crisp, clung to the squash well, and not greasy. Good flavor overall. The Pulled Pork Nachos are new to the menu and gaining popularity. Leslie says it’s one of their best sellers. It’s easy to see why. The tortilla chips are house fried. Powell rubs their signature BBQ rub on the tortillas, cuts them into triangles, and fries them up. 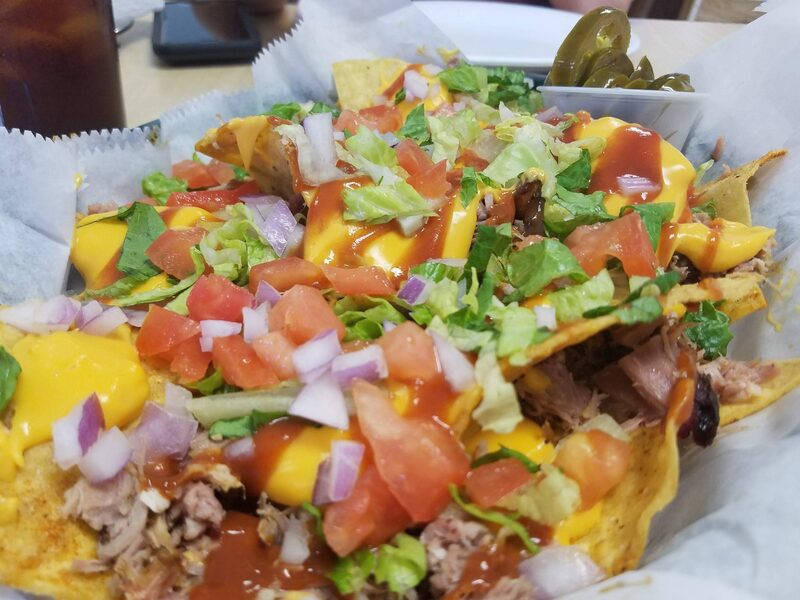 Those chips are then topped with pulled pork, nacho cheese, their house made sweet BBQ sauce, lettuce, tomatoes, and red onions. The chips were fried perfectly. They were crispy, not greasy. The BBQ rub was on every chip and added a nice spiciness to each bite. The nacho cheese and sweet BBQ sauce, in theory, shouldn’t work well together, but in application, absolutely do. It’s a great combination of sweet BBQ sauce and salty nacho cheese. Also, something not everyone thinks about, but the chip-to-topping ratio was spot on. Every chip had a bite of all the toppings. There wasn’t a naked chip in the basket. The pulled pork nachos were great and I would order them again in a heartbeat. For the main event, Leslie brought out the BBQ Platter for Two. It was an obscene amount of meat with ribs, brisket, turkey, and pulled pork. It also came with sides; mac & cheese, baked beans, green beans, French fries, and 4 slices of garlic Texas Toast. Powell uses blackjack oak, a species native for Florida, in his smoker. He says it produces a consistent temperature in low and slow applications, ideal for smoking. It also gives a mellow smoky flavor to meats. BBQ is also about sauces and Powell makes three different kinds all in house; a sweet and smoky sauce, a mustard based sauce, and a vinegar based sauce. I have a bit of a sweet tooth so naturally I gravitated toward the sweet sauce. My favorite type of BBQ is ribs. It doesn’t matter if it’s pork, beef, St Louis style, or babyback. If it’s a hunk of meat wrapped around a handle of bone, I’m all about it. Powell cooked these pork ribs beautifully. They were smoky, tender, and delicious. The meat practically leapt off the bone. They were great without sauce, but the house made sweet BBQ sauce was a perfect complement to these ribs. I mowed through the first rib like a crazy cave man discovering meat cooked with fire for the first time. I love a good smoked turkey breast. Powell’s turkey is great. It absorbed a bit of the smoky flavor from the blackjack, was fork tender, and took to sauces well. All three types of sauces worked well with the turkey. 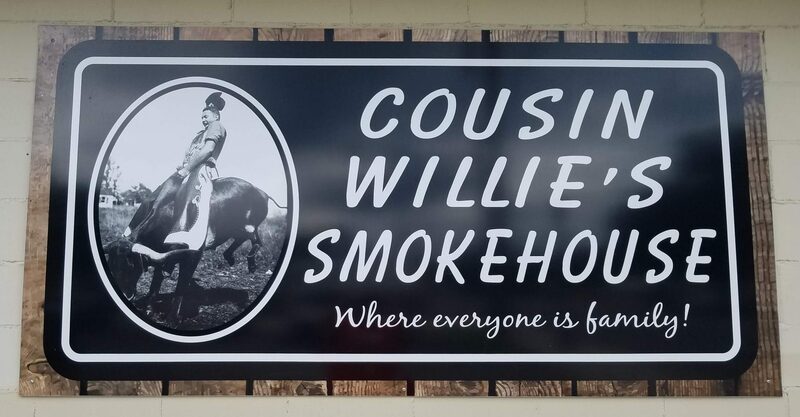 On a side note, during the holidays, if you have a turkey or ham or any other packaged meat you want smoked for your party, Cousin Willie’s will do that for you. I highly recommend you take advantage of the smoker-for-hire. I cook turkey once a year and it only comes out edible on odd numbered years, so if I’m able to bring Powell a turkey to smoke for me, I’ll look like the Thanksgiving hero. The pulled pork was the same pulled pork they used for the nachos and were just as delicious without the nacho cheese. The brisket had a slight smoke ring, a nice bark, and glistening layer of fat that kept the whole thing juicy. As much care as they took with the meats, the same attention went into the sides. The mac & cheese were a perfect creamy consistency. The cheesiness gave me a nice break in between the meat sweats. The green beans were seasoned with the pulled pork, so it had the same type of smoky flavor. I’m not normally a baked beans kind of guy, but these were great. They were sweet, tender, and velvety. The French fries are hand cut and bigger than your normal fry. I called them “baked potato sticks” because they reminded me more of a baked potato than a French fry. They were crispy and salty on the outside, light and fluffy on the inside. A great vehicle to slather up all the wonderful BBQ flavor off the plate. 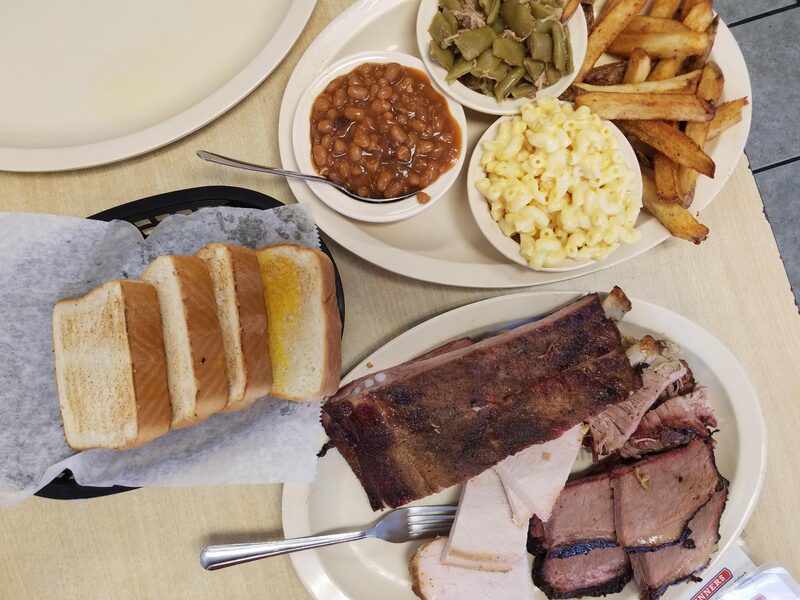 Cousin Willie’s Smokehouse is good old fashioned country BBQ with a family feel. It’s comfort food. It’s the kind of BBQ you get and want to take a nap afterwards. Is it higher end and fancy like Gilbert’s Social or The Bearded Pig? No, and it’s not trying to be. It’s simple BBQ done well and at a price point everyone can afford. So the next time you’re on the way to a Noles or Gator game, stop by Cousin Willie’s and pick up some ribs and other BBQ goodies for your tailgate or game viewing party. It’s worth the stop. Tagged bbq, Casual, catering, Dinner, Family Friendly, kid friendly, lunch, meat sweats, road trip, westside. Bookmark the permalink. I’m so happy you are ‘taking care of business’….it’s what we need…. checking out restaurants truefully !!! THANK YOU! !